The Nexus 7 tablet uses a slightly updated Gallery, but for the most part it looks identical to the ICS app. The Default view of the gallery is Albums, which is what we're used to seeing - it lists all folders with photos in a rectangular grid. The gallery doesn't display more items at a time, despite the bigger screen, but at least the thumbnails are bigger. Anyway, besides the Album view, you also get Locations (photos are grouped based on where they were taken), Times (grouped by when they were taken), People (photos with tagged faces in them) and Tags (these are general tags you can add manually). A handy option is the Make Available Offline feature - it lets you easily select multiple online albums and download them for offline viewing. The Gallery app supports online albums like Picasa (but not Facebook) and you can set it to sync photos only over Wi-Fi. Getting inside an album displays all the photos in a rectangular grid, which is horizontally scrollable. When you try to scroll past the end, the photo thumbnails will tilt to remind you. Viewing single images has been tweaked somewhat. You still get the convenient share button along with a Crop tool and an Editor (we'll get back to it in a minute). The filmstrip of thumbnails at the bottom of the screen that the ICS gallery introduced is gone - instead, you can pinch zoom out to get to a similar, but bigger, strip. This is an easy way to quickly browse photos but also delete some - you just swipe them up or down. When you discard an image, an undo button appears allowing you to bring it back. The editor offers lighting adjustments, effects, color styles, red eye correction, rotating and straightening a photo, sharpening and face glow and face tan (which detect faces automatically). Most of these options have a slider that lets you apply the effect with the desired intensity. The Movie Studio app that debuted with Ice Cream Sandwich and allowed users to edit their videos is nowhere to be found here. The video player has been neglected by Google and there's still no dedicated videos app (you have to go through the Gallery). Even the DivX/XviD support introduced in the Galaxy Nexus is gone. You have to consider that Google expects videos on the Nexus 7 to come from the Play Store, so they'll be appropriately encoded. What does work is MP4 files and MKV files. AC3 and DTS sound are no-go, however. That's not a huge issue though, the Tegra 3 chipset is quite powerful and you can always just grab a free third-party video player that supports the formats and other features you need (e.g. subtitles). The bigger problem here is the lack of TV-Out. No MHL port means no way to play the video on an HDTV. The 7" screen on the tablet is pretty big though and despite not having the greatest viewing angles, the Nexus 7 still makes for a decent portable video player. Plus, if Google has its way, the Nexus 7 will be used to control a Nexus Q, which will be hooked up to a TV, and the tablet's screen will only be used to resume watching a video when you're not at home. Our usual video test wouldn't run due to the poor codec support on the Nexus 7 (we even tried the MP4 file we use for Windows Phone devices, but that didn't help). We installed BS Player and ran the test with it (for other devices, we use the native player). The Nexus 7 lasted about nine and a half hours of playing an SD video. That's not bad at all, considering the big screen. Officially, the tablet is rated at 9 hours of HD video playback. You can learn more about how we do battery tests here. The Nexus 7 comes with its own music player app and the interface is somewhat similar to the gallery - you get a grid of thumbnails, but instead of folders they represent albums here. Unlike the gallery where you have a dropdown menu, tabs are used here to organize your music library - there's Playlists, Recent (the default view), Artists, Albums, Songs and Genres. Most views use a simple list (potentially with the album art on each line) instead of a grid. You can tap on a line to open in to tap on the small arrow at the right to open a menu with some options - queue the track/album/artist, delete it or shop fore more stuff by that artist, which of course takes you to the Google Play Store. The Now playing interface features the album art with the track info and playback controls below it. You can tap it to reveal more options - upvote/downvote the song, a bar to scrub through the song and shuffle and repeat toggles. From the Settings key you can get into the equalizer. It can be turned on and off and features several presets along with a user defined one. If you plug in a headset, you can also play with the Bass boost and 3D effect sliders. While the player is working, the lockscreen features the album art and track info for the current song along with simple playback controls. There playback controls in the notification area too. 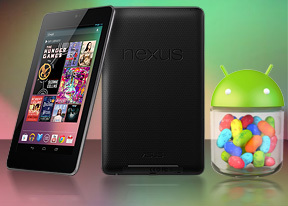 Sadly, the Google Nexus 7 turned out to be quite a disappointment in our audio quality tests. We are not sure what's the case with Tegra 3 devices doing badly in this test, but we really hope Nvidia and the manufacturers figure out the problem and fix it soon. So here's the deal - when connected to an active external amplifier the Nexus 7 is really loud device with excellent frequency response and little distortion. Unfortunately, its stereo crosstalk is above average for this scenario, while the noise levels and dynamic range readings are disappointing as well. A whole lot started to happen when we plugged in a pair of headphones. 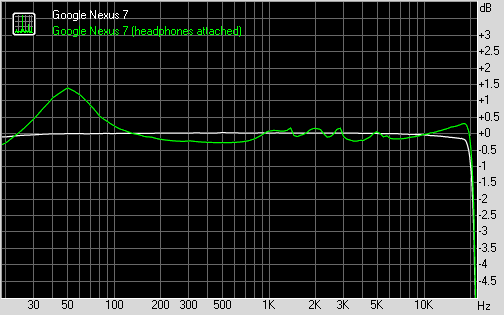 For one we got the usual amount of extra stereo crosstalk, and the volume levels dropped to average levels. Intermodulation distortion increased quite a bit, while frequency response worsened notably. Surprisingly, noise levels improved, but dynamic range remained mediocre. We are really used to seeing excellent or at least very good output from tablets and the Nexus 7 with all those weak points came out as an unpleasant surprise.